With two headline-grabbing acts of violence in recent days allegedly involving religious Jews – and with the secular media “on the warpath” against rabbis whom they accuse of “inciting the public” to acts of violence – dozens of Religious Zionist rabbis have issued a proclamation against the use of violence, in any context. Jews have historically been known to be “very sensitive to the value of human life. Any veering away from this principle was immediately and sharply criticized by the prophets. The First Temple was destroyed because of murder, among other things, and hatred leading to murder destroyed the Second Temple. On Sunday, 16-year-old Shira Banki died in hospital after being stabbed in the back by haredi extremist Yishai Schlissel, who attacked marchers at the annual Jerusalem gay parade last Thursday. Five other people were also injured in the attack, one of them seriously, before Schlissel was wrestled to the floor and disarmed by police. 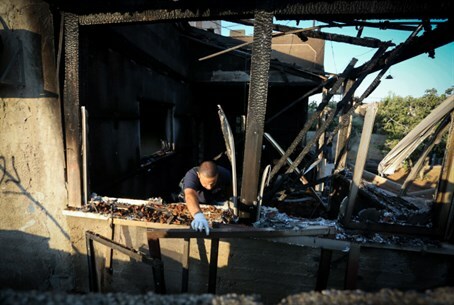 Meanwhile, the IDF and Shin Bet (Israel Security Agency) are frantically investigating the firebomb attack at the village of Duma early Friday, in which 18-month-old Ali Dawabsha was burned to death. Officials said that they suspect Jewish extremists from nearby communities, reports in the Israeli media said Sunday. On Friday, Channel One hosted a symposium to discuss both acts of violence, with numerous public figures weighing in. The fault, according to most of them, was with “the rabbis,” who “incite” religious Jews – both hareidi and Religious-Zionist – to attack those with whom they disagree politically and religiously.